The cool, classy and timeless gold Gorjana’s Taner necklace stole my heart. I was introduced to the amazing jewelry collection of Gorjana&Griffin in Dallas and I did have an urge to wear all of their creations at once. They are definitely the go to jewelry that match with everything and are perfect for layering. Stucking up necklaces, bracelets and rings starts the moment you add a second piece of jewelry. Coco Chanel’s famous quote about jewelry is: Before leaving the house, a lady should look in the mirror and remove one accessory. Needless to say, a quick look on pinterest boards with the theme stucking jewelry will reveal that is not the case now. Stacking is trendy and fun. Ok, maybe not 10. But you get know what I mean. PS. Regarding the new collaboration of Gorjana and Griffin with Courtney Kerr you can get an inside look from the Courtney loves Gorjana video. I already told you Niki’s favorites from the new collection, so now it’s my turn. My number one piece is the avant-garde bracelet called Uptown Ring to Wrist Cuff and the downtown layered cuff. 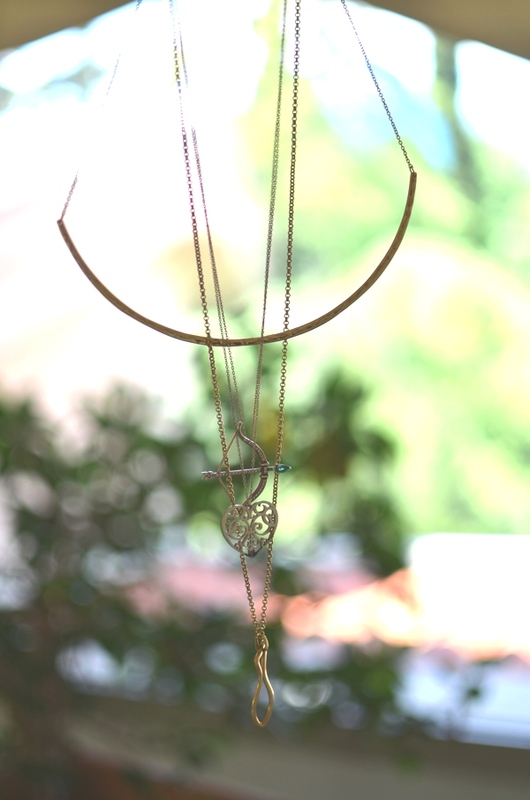 I love layering delicate jewelry it makes such a statement !